Corporate Europe Observatory has summarised the content of several new Monsanto Papers, which were released on 27 and 28 October 2017. The summary of the exchange between the European Food Safety Authority (EFSA) and the Environmental Protection Agency (EPA) , as well as the one of the European Chemicals Agency (ECHA) action plan  have been provided by Friends of the Earth Europe. ...the possibility that EFSA dismissed the IARC Monograph on the carcinogenicity of glyphosate before it was even published. ...Monsanto’s ‘ECHA action plan’ including the involvement of “independent experts”. Older documents provide evidence of more third-party scientists that Monsanto considers to be “on their side”, some of who still play a role in the debate (e.g. Keith Solomon). ...how Monsanto is trying at all cost to get regulators to stick to their preferred No Observed Adverse Effect Level (NOAEL) for glyphosate, which constitutes the basis for the determination of Acceptable Daily Intake levels, although the conclusions of one of Monsanto’s own glyphosate studies pointed at a lower one. ...studies on dermal absorption of glyphosate and glyphosate-containing formulations that worry Monsanto, and which the company aims to have stopped or countered for that reason. Dermal absorption is a key route for occupational exposure. ...Monsanto admitting that the company has “vulnerabilities” regarding the IARC assessment in epidemiology, genotoxicity and other areas. Monsanto’s remark that the glyphosate-producing industry needs to “string together to help the cause”, even if not scientifically justified. ...a Monsanto 'clearance form' to be filled in by authors of manuscripts before they are submitted to scientific journals. This particular 2012 document lists David Saltmiras and Larry Kier as authors of the corresponding study, which was later published as ‘Kier & Kirkland 2013’ - confirming the ghostwriting. 1. Did EFSA dismiss IARC assessment before it was even published? In Europe, the EU’s food safety watchdog EFSA together with the EU’s chemical safety agency ECHA has taken an opposing line to the IARC assessment of glyphosate as a ‘possible human carcinogen’. However, new documents released in the USA now cast doubt on EFSA‘s neutrality when considering the IARC conclusions, and question whether the agency was influenced by the Monsanto-connected EPA. Certain email exchanges within the EPA in May 2015 indicate that EFSA had approached the EPA and – as early as then – stated that they were going to disagree with IARC’s assessment. This raises serious questions, since the IARC Monograph containing the data on which the cancer agency based its March 2015 assessment had not yet been published at the time – and only became available to EFSA and others on 29 July 2015. In addition, the German authorities at the Bundesamt für Risikobewertung, which were the official EU rapporteur for glyphosate, had also not conducted their own assessment of the IARC conclusions before 31 August 2015. This indicates that EFSA had already made up its mind to fight the IARC verdict before it had seen any data underlying the assessment or had done its own assessment. Emails sent to Friends of the Earth Europe by IARC confirm that they did not send the Monograph to EFSA before publication, and only provided them with the references they used. A timeline of the EFSA process can be found here. [Update from 10 November 2017] EFSA strongly contested this in an email to CEO, saying that "at that point in time (May 2015) it was obvious that the views of EFSA and Member States on glyphosate carcinogenicity, expressed in February 2015, would be divergent from (“…will disagree…) with the IARC monograph due to published in July. [...] EFSA can confirm that there was no pre-judgement of the IARC monograph". EFSA added that IARC's opinion was only assessed in the addendum to the RAR prepared by the BfR in August 2015, and that "your article presents a partial, one-sided version of events and unfairly casts doubt on the integrity of the scientific process we followed". Although EFSA only published its glyphosate conclusions on 12th November 2015, there are other indications beyond the above emails, that they were coordinating with the EPA, and may possibly even have been influenced by them. Seeing the EPA’s proximity to Monsanto, this is rather worrying. This document, for instance, contains text-message correspondence between Mr. Daniel Jenkins (Monsanto Company Director of Regulatory Affairs, United States), various Monsanto employees, and several EPA officials regarding regulatory aspects of glyphosate. In addition to questions being raised about the role of EFSA there is also clear evidence that Monsanto was influencing the European scientific debate through attempting to pay scientists and then covering their tracks so that the scientists appeared to be neutral. 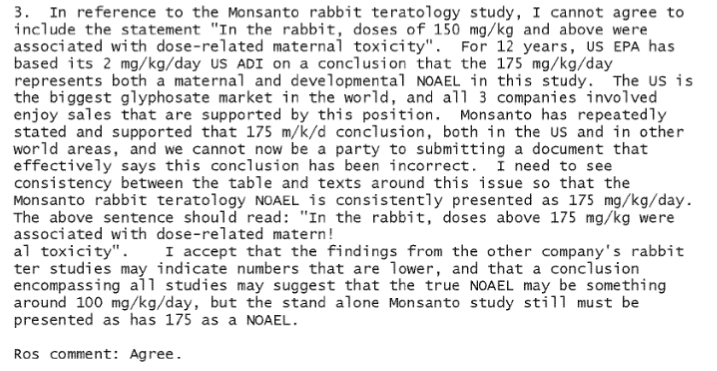 A very clear example is this previously released exchange between Daniel Goldstein from Monsanto and Professor Allister Vale (Past-President, Clinical and Translational Specialty Section, Society of Toxicology, Past-President, British Toxicology Society, Past-President, European Association of Poisons Centres and Clinical Toxicologists). In the view of Monsanto Vale is one of Europe’s leading toxicologist and “highly influential”. Vale appears enthusiastic to set up the group, proactively asking others informally and making constructive ideas on its format. He also suggests that this group might “encourage individual medical/clinical toxicologists to consider a direct advisory role” to Monsanto. Monsanto offers money, but aware of the sensitivities of industry funding “independent” scientists makes a suggestion to hide the payments. “Cost (including honoraria) will be picked up by Monsanto via an appropriate granting mechanism which allows for a proper degree of academic independence, and we can provide (or provide support for) logistical assistance so that this does not become an undue draw on your time and that of Sir Collin.” Sir Colin Berry is a well known support of the chemical companies (co-author of some of the ‘Intertek papers’ and vocal in the debate on endocrine disruptors). Although Vale makes it clear he can’t be funded directly by Monsanto it appears they agree on a solution where the group is financed through the Glyphosate Consortium (I assume this the Glyphosate Task Force – the industry working group on EU re-authorisation) and that it will fund a meeting of the EAPCCT and ACMT. Also interesting for the EU process is this document showing Monsanto’s plan for dealing with the EU chemicals agency. Their plan outlined therein is to “convince independent experts to submit arguments against STOT-RE [Specific Target Organ Toxicity] as well as issuing reinforcing comments confirming no need for carcino-map which influencial experts wants to do this [sic] (no funding; sensitive!)”. Years earlier, in April 2001, Donna Farmer, toxicologist in various roles on Monsanto’s regulatory affairs team (= lobbyists) exchanged emails with other Monsanto staff including Stephen Wratten. Farmer listed a number of allegations against Roundup that had been made by groups such as the Northwest Coaltion for Alternatives to Pesticides (NCAP). She suggested third-party scientists who could be useful in the rebuttal of these claims, including Len Ritter, Frank Dost, Keith Solomon and John Geisy, and clarifying to Wratten that “they are on our side”. Farmer provided examples of other cases in which these third-party scientists had been helpful to industry. “For example PSE&G hired Solomon and Ritter to help them defend the use of Rodeo in the estuaries near their Nuclear Power Plant”. And she described how British Colombia Railway hired Frank Dost to review the NCAP’s fact sheets. In addition, Keith Solomon in 2013 did research paid for by Monsanto, as is shown by this email exchange. He is also author of one of the studies reviewed by IARC in their glyphosate assessment. This 2009 study considered the effects of glyphosate spraying “in subjects from five regions” in Colombia. In 2015, Solomon claimed that IARC “incorrectly quoted and/or misinterpreted” this study. An exchange on the differences in the weight placed on different parts of the data between IARC and the authors can be found here. In 2003, Stephen Wratten, Mark Martens and Donna Farmer of Monsanto exchanged emails with Syngenta and Cheminova employees, commenting on work done by the the Joint FAO/WHO Meeting on Pesticide Residues (JMPR). The 2016 opinion by JMPR about glyphosate in the diet was controversial because of strong conflicts of interest of panel chair and vice-chair Alan Boobis and Angelo Moretto with food industry lobby group The International Life Science Institute (ILSI). Wratten suggested for particularly focus to be laid on “items that may inadvertently lead reviewers toward a determination that the overall controlling NOAEL would be lower than approximately 100 mg/kg/b.” NOAEL is the “no observed adverse effect level”. On page 4, Wratten says: “I believe their [sic] needs to be a harsher dismissal of the spurious literature articles. I prefer a killing blow”. He names an example of a study in response to which he would support “simply stating that the complete premise of the work is far-fetched adventuring into a theoretical world of “what-ifs”, in order to justify the complete dismissal of the study. Richard Garnett says: “From a regulatory angle, there is no point in pursuing the studies further”. Farmer asks for clarification: had it not been decided not to do any further dermal penetration studies, with or without surfactants? Broeckaert, then of Monsanto Europe, states that even though TNO proposed to repeat the study, “we came to the conclusion that the penetration of glyphosate would have been [probably] greater than the 3% already imposed by the German authorities. We decided thus to STOP the study (effective today morning)”. Broeckaert has since 2011 been a “senior scientific officer within the unit of classification and prioritisation in ECHA”. As his current employer states, “before joining ECHA, he worked 12 years in different industrial sectors as regulatory and registration toxicologist”. TNO is a Dutch consultancy that works both for government and private clients. It has yet to respond to questions by Corporate Europe Observatory regarding their involvement in this case. Interestingly, the current Chair of ECHA’s Risk Assessment Committee responsible for the review of glyphosate, Tim Bowmer, worked at TNO at the time, manning different positions related to the risk assessment of chemicals. In the period 1991-2012, he undertook “occasional personal research projects”, among others for Brussels-based chemical industry lobby group CEFIC. NGOs have complained about this conflict of interest. In 2001, Monsanto St Louis and Monsanto Brussels co-authored a confidential piece titled “Clustering glyphosate formulations with regard to the testing for dermal uptake”. Written by Belgian Mark Martens, Christophe Gustin, and C Bates, this document admits that up to that point Monsanto had tested only one formulation, MON 2139, with regard to dermal uptake. It also states that the formulations are so different that dermal uptake cannot be extrapolated from MON 2139 to any other formulations. “Ideally, all glyphosate formulations would have to be tested for dermal uptake”, the document argues and lists at least six ways that surfactants increase dermal uptake of glyphosate, including the removal of lipids from the skin or increased contact time. In November 2008, Monsanto staff scientists were preparing for a meeting of regulators, a context in which Joel Costa writes that “it is critical that we have our product accepted at this coming meeting”. The staff seems worried that other studies shed doubt on Monsanto’s understanding of how glyphosate is excreted by animals or humans: via feces or urine. One study (the “Wester study”) is considered to be a problem, and “other animal data confirm Wester findings”. But Joel Kronenberg says this would “likely require a repeat of the monkey dermal and intravenous studies”. A repeat of the study, he says, might “not be easy nor inexpensive”, and “not totally without risk”. 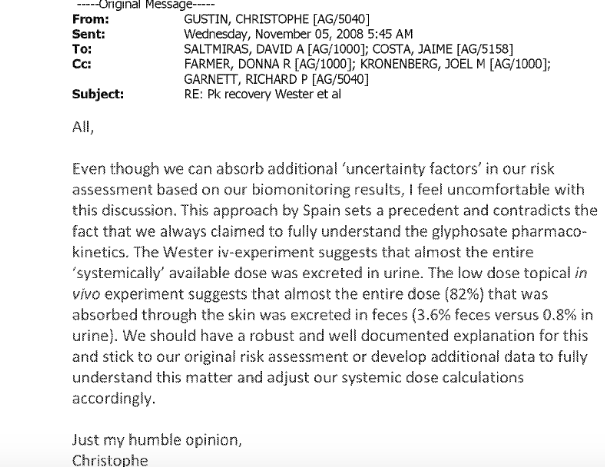 In 2009, David Saltmiras of Monsanto suggests to Christophe Gustin that they submit an abstract on dermal uptake of glyphosate to that year’s EUROTOX conference, held in Barcelona. Gustin agrees but warns about not giving away “proprietary formulation data and our competitive advantage”. Richard Garnett reacts with caution: he also wants to pin down the “excretion issue” before presenting. “ADME has been the weak link in our argument and the Spanish response shows we have not got rid of the problem. Why does Syngenta not have the problem?” ADME stands for absorption, distribution, metabolism, and excretion. In 2014, Monsanto’s William Heydens brings up that industry lobby group the Glyphosate Task Force (GTF) should raise funding for research to counter IARC, after a call with “outside epidemiological experts that Donna lined up”. They have realised they can’t put together a publication that can be completed prior to IARC’s meeting in March 2015. Heydens: “One has to consider that this situational timing did not happen by chance and that more than just pure bad luck is working against glyphosate”. Heydens says: “And while we have vulnerability in the area of epidemiology, we also have potential vulnerabilities in the other areas IARC will consider, namely exposure, genetox, and mode of action (David has the onco studies under control)”. Monsanto has a ‘manuscript clearance form’, a form that researchers working for Monsanto have to fill in before they submit papers for publication in scientific journals, in this case the study by David Saltmiras & Larry Kier in 2012. This article was published in 2013, no longer naming Saltmiras as Kier’s co-author, but rather crediting David Kirkland. The clearance form in this case confirms the ghostwriting by David Saltmiras, something which a previously released email exchange had already indicated, (“So we thought we needed to re-group & re-design the approach to the manuscript” see below). The form (p.5) states that the author has to “make sure manuscript is consistent with the Regulatory and Biotechnology publication strategy”, something which also applies for any policy statements.